Thea has a Bachelor of Arts from the University of Victoria, a Bachelor of Science in kinesiology and athletic therapy from the University of Winnipeg and a Master’s Degree in Physical Therapy from UBC. 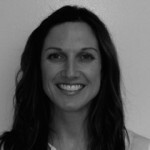 She has worked as a trainer and athletic Therapist with sports teams including rugby, lacrosse, hockey and soccer. Thea completed her acupuncture certification in 2014, IMS/Functional Dry Needling certification in 2016, and is currently pursuing her postgraduate orthopaedic manual therapy levels. She has a particular interest in core stability and low back pain. Outside of Physiotherapy, Thea enjoys playing soccer, running with her dog, CrossFit, yoga, cooking and music.